In an interview with NDTV, CEO of Microsoft, Satya Nadella, spoke on Artificial Intelligence (AI), and its potential for making human lives better. Speaking to Dr Prannoy Roy, he discusses the future of industry, technology trends and Microsoft’s work with partners like ICRISAT in digitally transforming organizations and society. In this clip, excerpted from NDTV’s telecast from 6 November 2017, he speaks on how Microsoft’s collaboration with ICRISAT is helping farmers improve yields through a Sowing App that provides farmers customized advisory services. 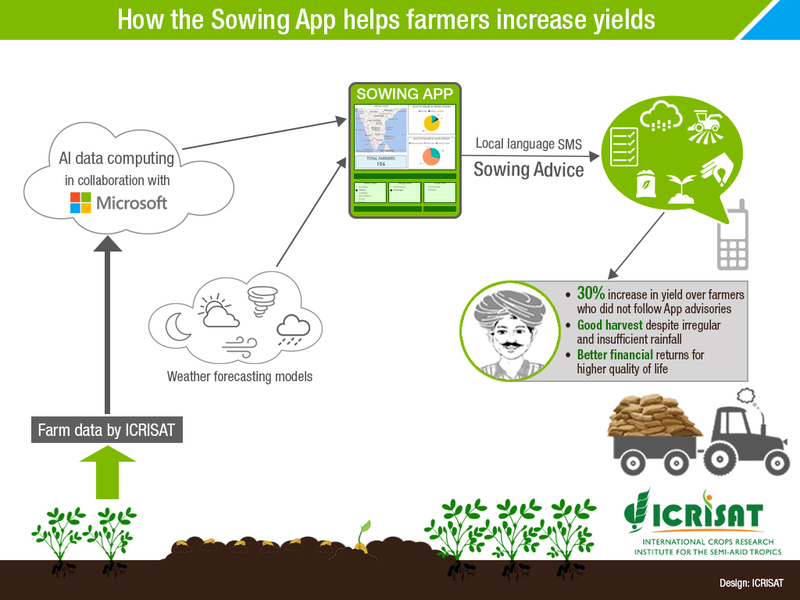 The Sowing App, developed in partnership with ICRISAT with the help of Indian weather institutes, uses artificial intelligence and crop modelling tools to provide farmers customized real time advisories. Using these tools, researchers could define for each village a moisture adequacy index through computation of local soil data, such as data on soil water retention capacity, historical and actual climate data and five-day weather forecasts. Such an index helps define optimal sowing timings. Additionally, the app sent farmers customized messages that advised them on land preparation, seed treatment, application of nutrients, pest and disease management, water management and harvesting, helping farmers achieve better optimal harvests. In Andhra Pradesh where the Sowing advisory was developed in 2016, and used by 175 farmers in a pilot phase, the app is now being scaled in all 13 districts. A first impact study has shown a crop yield increase of 30% per hectare for farmers using the app. The pilot was implemented in Devanakonda Mandal in Kurnool district and the advisory applied to the groundnut crop. 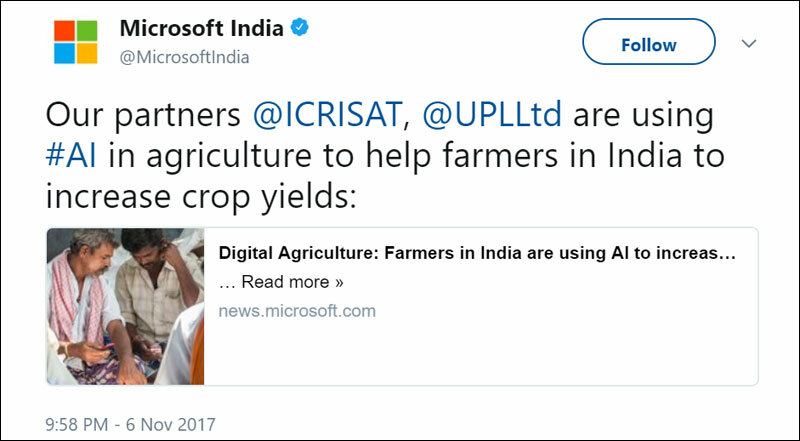 Last month, the Government of Karnataka announced the signing of a Memorandum of Understanding (MoU) with Microsoft to empower smallholder farmers . As part of this agreement to scale up the digital farming practices in the state, the Sowing Advisory Service developed in collaboration with ICRISAT is expected to play a crucial role. The advisory service has already been deployed on a limited pilot in the kharif season, under the Bhoochetana project in Karnataka.